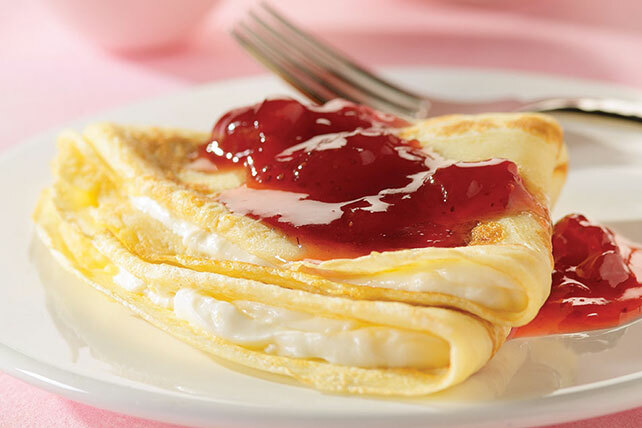 Try this elegant dessert or brunch dish of homemade Creamy Crêpes, spread with a lemony cream cheese, folded and served with a warm strawberry sauce. Whisk eggs and milk in medium bowl until blended. Stir in flour. Let stand 30 min. Spray 8-inch skillet with cooking spray. Heat on medium heat. Pour 1/4 cup batter into skillet; tilt skillet to evenly cover bottom of skillet with batter. Cook 1 to 2 min. or until bottom of crêpe is lightly browned. Run spatula round edge of crêpe to loosen from pan; turn crêpe. Cook 1 min. or until bottom of crêpe is lightly browned. Remove from skillet; set aside. Repeat with remaining batter to make a total of 8 crêpes. Beat cream cheese, sugar, lemon zest and juice until blended. Spread 2 rounded Tbsp. cream cheese mixture onto each crêpe; fold into quarters. Place on dessert plates. Cook and stir preserves and water in saucepan on low heat 2 to 3 min. or until heated through. Spoon over crêpes. Coffee and Dessert Pairings: Finish off a wonderful evening with the perfect pairing of home brewed McCafé® coffee and dessert. Dark-roasted coffee like McCafé® French Roast stands up well to rich desserts, such as creamy crème brulee, cheesecake, tiramisu or chocolate mousse. Medium-roasted coffee such as McCafé® Premium Roast matches nicely with other chocolate desserts, such as chocolate cake, and spiced desserts, such as carrot cake or a cinnamon-spiced apple pie. Choose light-roasted coffee like McCafé® Breakfast Blend when serving plain cakes, cookies and fruit desserts, such as fruit crisps or pies. Since this simple, yet elegant, recipe serves 8, it's the perfect dish to serve at your next brunch. Substitute grape jelly for the strawberry preserves.